"A quick, easy and surprisingly delicious vegan pick-me-up that makes the most of raw superfoods and protein-rich soy. I make one of these healthy treats for myself every morning for breakfast, and it powers me all the way until lunch. I love the mild sweetness of the banana, but if you want it sweeter you could add sugar. I've also added different things like fresh ginger, cinnamon, apple, or any number of other things. Raw vegans can substitute raw almond milk for the soy. Feel free to experiment with different flavors, and enjoy the pure energy that comes from eating delicious and good-for-you food!" Blend soy milk and spinach leaves together in a blender until smooth. Add banana and pulse until thoroughly blended. See how to make an energy boosting smoothie. You can substitute vanilla soy milk for the plain soy milk, if desired. Most of us know how good spinach is for you. But let's be honest, no one wants to eat nothing but spinach salad every day. 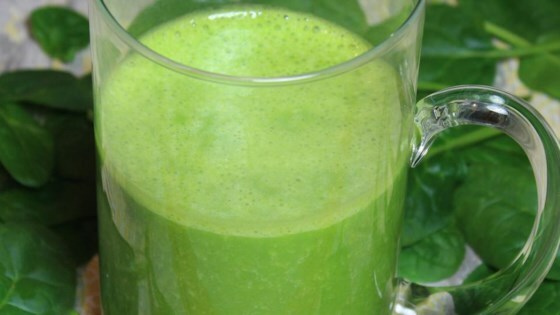 Bananas are truly a miracle food because you won't even taste the spinach in this smoothie! It's a great way to reap all the nutrition benefits of fresh spinach without even knowing you're eating it. Strong banana flavour and quite sweet. I prefer Breakfast Banana Green Smoothie. Others have suggested to use blueberries or canned pineapple for a different flavour. I used milk. I traded soy for regular milk. and added blueberries and protein powder. I subbed unsweetened almond milk for the soy milk it was really good I will definitely be making it again.